Italy is the kind of place that, I’d argue, is romantic almost no matter where you go or who you’re with. If you’ve chosen Italy for a honeymoon or a couples’ vacation destination, though, the romance factor is especially heightened – which means the pressure is on. The thing is, “romantic” means wildly different things to different people. Just as not every traveler will find my idea of the perfect two-week Italy itinerary to be perfect for their needs, not every couple will think my notion of a romantic Italy itinerary is what they’re looking for. My hope is that you’ll be inspired enough by something you read below to craft your own perfect itinerary if this one doesn’t suit your needs. Before I get started on the itineraries, however, a few general rules apply. I am assuming a two-week period of time for these trips. I realize not everyone spends two weeks on holiday. If you’ve only got a week or so, you’ll need to adjust these plans accordingly. I encourage travelers to book what are called “open-jaw” tickets whenever that makes sense, allowing you to fly into one city and out of another, in order to avoid back-tracking. That usually wastes time, which you already don’t have enough of, so it’s always worth looking at your open-jaw ticket options. In the itinerary detailed here, it would be best to fly into Venice and out of Rome. If your idea of a romantic trip in Italy involves things like mountain biking, skiing, camping, or the like, I haven’t included that here – so you’ll need to add those activities in yourself. I guess I’m generally a lazy romantic. I also haven’t made this a beach-centric itinerary. I realize that for many, a romantic vacation is synonymous with lying on the beach. If that sounds like your ideal trip, you can easily book a week or so in the Amalfi Coast or Taormina and probably be quite happy. Want to tailor-make your trip for your individual tastes? Check out my step-by-step guide to creating perfect Italy itinerary for any trip. This itinerary focuses on historic towns that are (as the name suggests) ideal for long, aimless strolls with your sweetie. Yes, there are sights to see, and in most of these places there’s nothing so pressing that you’ve got to race around like a crazy person. Relax into your trip, spend lots of time gazing into one another’s eyes, and enjoy the beautiful backdrop that is Italy. As a bonus, because this isn’t a beach-centric itinerary, it works no matter what the weather is. In the winter, you may be more inclined to sit in a cafe with a cup of something warm rather than walk through a town’s cobblestoned squares, but cold weather is a good excuse for cuddling. With a morning arrival in Venice, you’ll have about two and a half days to explore the city at your leisure. Visit St. Mark’s Basilica and the Doge’s Palace; take a half-day trip to the islands of Murano, Burano, and Torcello; learn about Casanova’s ties to Venice; book a gondola tour if that suits your fancy. After your third night in Venice, take the train to Verona (the faster trips take just over an hour). Verona is the city of Romeo and Juliet, but there’s more romance in the city than just that (admittedly sad) tale. Choose a hotel in the historic center so you’re surrounded by the beautiful old buildings. Tour the ancient Roman Arena (see an opera there if it’s during the summer opera season); visit Juliet’s balcony (nevermind that it’s a recent construction); wander the pretty piazzas. Take a day trip to nearby Lake Garda (buses connect towns on the lake with Verona in 1-2 hours, depending on the lake town) to enjoy some lakeside scenery (you can hike around the lake if you like), or book a wine-tasting tour of the Valpolicella region just north of Verona. After your second night in Verona, you’ll rent a car and start the roughly 3-hour drive to San Gimignano (if you stick to the highway). San Gimignano doesn’t have a train station, so if you’d rather not drive, you could choose Siena over San Gimignano – that train trip is between 3.5-4.5 hours, with a couple of transfers. San Gimignano is small, so your hotel options are limited. Pick a hotel inside the historic walls for maximum strolling time, or an agriturismo in the surrounding countryside for views and quiet. Either way, ask about where to park your rental car when you arrive. 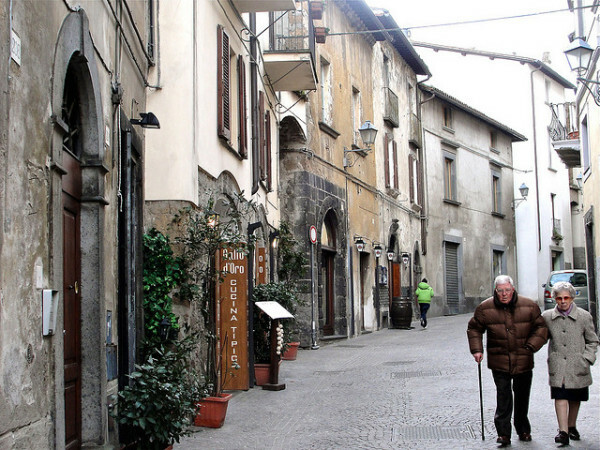 The tiny town fills up during the day with day-trippers, and empties wonderfully at night. Wander anywhere you like, climbing towers and visiting historic churches along the way. Take day trips with the car and GPS, turning down roads that seem interesting and letting the GPS guide you home at day’s end. You could visit Siena or Cortona, go wine tasting in Chianti, or head for the cities of Florence or Pisa. After your third night in San Gimignano, you’ll head for either Orvieto or Assisi, both of which are in Umbria. San Gimignano-Orvieto is just over two hours by car, and San Gimignano-Assisi is about 2.5 hours. Both Orvieto and Assisi are historic hilltop towns, both romantic in their scenic beauty. Orvieto’s main attraction is its cathedral and the sweeping views from its perch atop a hill. Assisi is a famous pilgrimage destination, home of St. Francis, so it can be crowded at times (it’s usually more crowded during the day, and at holy days). Either one you choose, I’d recommend making this the drop-off point for your car so you can avoid driving into the hectic traffic of Rome. If you can’t drop the car off in Orvieto or Assisi, then look for rental car offices to the north of Rome, outside the historic center, and plan to take a taxi from there to your hotel. A train from Orvieto to Rome takes about 1.5 hours. From Assisi-Rome, the train is about 2.5 hours. Rome isn’t like the relatively peaceful towns you’ve stayed in up to this point in the trip, but I think it can be romantic if you have a relaxed attitude toward sightseeing. I’d recommend booking tours of the main sights (Vatican City and the Roman ruins of the Forum, Palatine Hill, and Colosseum) that include the “skip-the-line” feature. You’ll avoid waiting in long queues that are decidedly un-romantic. Stare in awe at the Pantheon; meander the cobbled streets of the Trastevere for a look at what old Rome once looked like; re-enact a “Roman Holiday” moment at the Mouth of Truth. You can begin planning your next Italy trip on the flight back home. Great informative website, well done! What I especially loved is that I don’t have to drive throughout the whole trip, because then I don’t feel I’m vacationing. I can use this itinerary as an anchor, any additional advice?